Leeann was very excited about working with Tattered Angels Glimmer Mist. She decided to take her project off the page and give this Prima canvas apron a scrappy misted makeover. Firstly she applied a heap of Hambly rub-ons and then sprayed the canvas apron all over using Glimmer Mist Chalkboard, and using the same colour she took the nozzle off and poured and flicked straight from the bottle onto the canvas. She then made a couple of circle masks and used more Chalkboard to add pops of colour. Next she mixed together texture paste and chalkboard, applying this through a mask randomly over the canvas apron. Then it was time to finish the canvas apron off by adding pen doodles and a bit of stamping. Final touches buttons and fabric tabs with a bit of machine stitching for extra detail. For this page leeann used the pleated ribbon strips by pink paislee and the chalkboard mist by tattered angels. Once dried she trim and machine stitched in place creating a colourful flow of ruffles. she also poured a small amount from the bottle and misted lightly with water, creating a watercolor effected. Here we have a project created by Rebecca Beattie who use’s tattered angels glimmer mist, glimmer clam, glaze and stamps in lots of different ways creating plenty of fabulous effects. She also provides us with a list of techniques she use. Thank you so much Rebecca for allowing us to share your fabulous project. You can see more of Rebecca’s work here. Here we have a beautiful page created by Renee Aslette. Who tells us that first she applied texture paste to her page using bubble wrap allowing it to dry and misted over the top. She also misted some of the flowers to help coordinate with the page, and finally adding small flicks with the nozzle end. Thank you so much Renee for allowing us to share this page. You can see more of her work here. Gosh how adorable is this page By Sharmaine Kruijver. She has used the Glimmer Mist colours Suede and Creme de Chocolat. Sharmaine has also used Juniper Glimmer Mist to colour the fabric doily. This page is also by Sharmaine Kruijver. She has used red and black Glimmer Mists on the tags and embellished them. We love how they just pop with that added colour of teal on the solid grey background. Lastly is this ATC card again using Red and Black Glimmer Mists. A big thank you to Sharmaine Kruijver for allowing us to share a few of her amazing projects. If you would like to see more of her work go here. The Chalkboard trend has entered it's way into the scrapping world. Stacey was excited to work with the new collection 'Memorabilia' by Teresa Collins Designs, they have hit the mark with this Chalkboard collection. This collection is so versatile, add any colour to it and it's going to work. The gorgeous 'frame' paper was cut out and layered around her photo. The Chipboard pieces where also a fun addition to the layout and the stamps, they are a must have for your stash. Stacey has also created a card using the Memorabilia collection. The black and white with a hint of mint truly makes a statement. Leslie Ashe is a new addition to the Teresa Collins DT. She has kindly shared this lovely layout with us featuring the Memorabilia collection. She also shows off the other colours of the collection. There’s always an elegance to Teresa Collins products, and it’s that elegance which is showcased so beautifully in Dedra Long’s layout above. We loved all the little touches but especially the file folder she has incorporated into this page, making room for journalling and beautiful quotes from the Memoriabila collection. These beautiful cards are created using the beautiful limited colour palette of the Memorabilia collection by Teresa Collins Design Team member Tessa Wise. You can see a tutorial of her stamping on chalkboard here. Designing with… Chalkboard and Stickers… and a new reader’s challenge! We’re back with more projects to inspire you to use chalkboard and stickers on your next layout, and to send it into us for the chance to win a fabulous prize pack from some of our favourite manufacturers. See our previous post for all the details here. Our own design team have, of course, come up with some fabulous ideas covering everything from pocket page or Project Life style ideas to traditional scrapbook pages and super creative cards. For this page, Danielle used a chalkboard patterned paper as the key focus of her layout. The Mind’s Eye paper design features a range of frames on the paper, which Danielle used as they were to frame pictures, a title, journaling and a few other details. Cardstock stickers, chipboard alphabet stickers, chalkboard stickers, a mistable canvas feather sticker and ribbons are among the embellishments used to pull the page together. A gently patterned paper makes a relaxed background for Danielle’s layout about a long-distance-friendship. Danielle used the chalkboard stickers from My Mind’s Eye Chalk It range, loving how the softer black of chalkboard made for a less harsh contrast than a true black would have been. Handwritten journaling in black pen connects the chalkboard embellishments with the broader layout design. Kim says that this is her first layout using the divided "project life" style page protectors and she loves them! She says that her layouts just came together so quickly that should couldn't help but go on to do a second. In Kim's opinion stickers are great embellishments for these types of layouts as they can add interest without bulk. To allow her to cross over the different divided sections, Kim has added stickers both above and below the page protector. Leanne loves using co-ordinated papers and stickers when designing cards. The fact that the stickers co-ordinate perfectly to the papers you have selected makes designing a breeze. Leanne has used the 6x6 paper pad and two sticker sheets from Echo Parks gorgeous Beautiful Life Collection to make these four cards. Not only has Leanne designed with stickers straight from the sticker sheet, she has also used a few techniques to transform them into 3D embellishments as well. Stickers are also perfect for personalising the inside of your card as well. Here Leanne continued the sentiment from the font of the card into the inside of the card. The flower stickers were given a dusting of glitter. This card was created using the triangle banner style stickers. Leanne wrapped them around the twine and attached them to the card in a number of different ways. Some were adhered flat, some were foam mounted and some were scrunched and partially adhered. By adhering the stickers in different ways Leanne hoped to give the illusion of the flags fluttering in the breeze. She then topped each flag piece with co-ordinating stickers which she attached in different ways as well. The sentiment on this card was made with a number of different coloured font stickers. Mixing up the font sizes and styles on the card allows you to create some more visual interest as well as making sure you can get the most out of every sticker sheet you have. For this card Leanne used a combination of flat and foamed stickers to create the main elements. The little triangle stickers were wrapped around some toothpicks to transform them into flags. The centres of the flowers were given a dusting of glitter using the Zazz Crystal Glitter Glue. Leanne has used the ticket stickers on the front of this card. To transform them into more of an embellishment rather than a flat sticker she used the EK powder tool to take away some the adhesive on the sticker then attached them to the card front using a combination of the remaining sticker adhesive and foam tape. This allowed her to add some dimension to the card front. The little heart in the centre of the ribbon bow was also a sticker which she attached directly to the twine and ribbon. The fishtail banner stickers from the elements set made a perfect border for this card. Leanne adhered them to some cardstock then trimmed out the fishtail pieces and mounted them on the card front. Leanne also gave some dimension to the butterfly sticker by adding some foam tape under the wings. 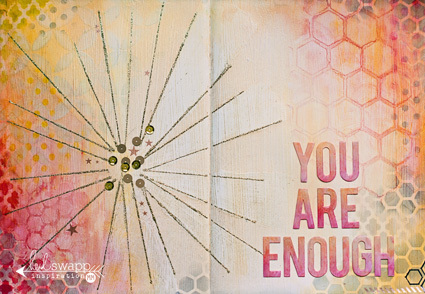 Leanne also loves to use a combination of fonts when adding sentiments to her cards. Here the mini alphas were adhered flat to the card front whist a little foam tape behind the “love” sticker added dimension.